Serve coffee in style with the Skyline Coffee Table from Armen Living. 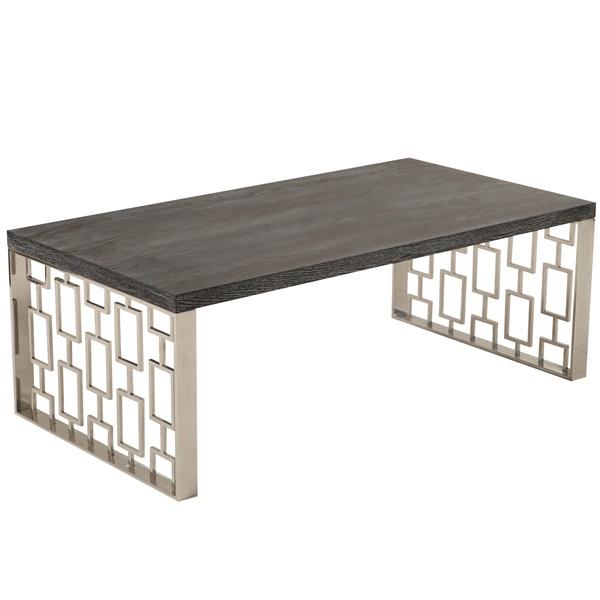 A natural top with a rich ash veneer finish and a strong, uniquely designed stainless-steel base make this piece half coffee table and half work of art. Intricately woven rectangle panels complete this beautiful, functional package. If you want to keep your guests and colleagues talking, all you have to do is gather them around the Skyline Coffee Table. Expert construction of quality MDF. Eye-catching base of laser-cut stainless steel for stability and shine. Complements other Skyline pieces by Armen Living.